Oddments Theatre Company's new production 'The Hiding Place' tells the true story of Corrie Ten Boom and her journey from watch shop to concentration camp. 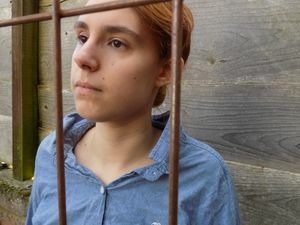 The two-act play will focus on what being a Christian means in the darkest of situtaions, how Corrie found strength in her faith and the positve effect it had on others in terrible circumstances. It is a true story of couragous actions and demostrates faith and love in action. Oddments produced the original script and is performed by a cast of siz. A professional build stage se. (adaptable for any kind of venue) props, costumes, soudn and lights will be used to enhance the quality of the production. The show will tour 15+ prisons and 50+ churhces and secondary schools throughout the UK. We are excited to go on tour this fall to share God’s love through Corrie ten Boom’s story, and we look forward to taking the show on the road! If you are interested in any of our productions, or you want to learn more about us, please feel free to find us on our website or call us at 01935 471547. To book us, please email Oddments or call us at the above number. Who are Oddments Theatre Company? Oddments had always run as a part-time team until 2010, when the first full time team was established. Initially, nobody applied. The situation was looking bleak, but eventually, applications began to trickle in. Five people really stood out as ideal candidates … and they became the team! A house was bought for them to live in and in September, they all moved in and began work in the newly built office. Since then the work of Oddments has continued to develop, we are now working with the seventh full-time team, which is proving to be just as successful as the first. With the new team at the helm of a work that started over three decades ago, which with God’s great blessing has steadily expanded. Without the help of Westhill, we would not have gotten this far. Oddments went live in the mid-eighties with the opening of its own bank account. The founder sat down with a bank manager who proceeded to inform him of the benefits of a community account, a deposit of just £1 was paid. The work of Oddments developed over the coming years, and the founder started to raise funds so he could work part-time for the group. On September 18th 2004, Oddments became a charity enabling them to receive gift aided donations which helped expand their work. Working in prisons became a large part of their mission work; however, the outreach began completely by accident. While planning a show, a letter was mistakenly sent to the chaplain at Portland Prison. He sent a kind reply, apologising that his congregation would be unable to attend for obvious reasons, however, he wondered whether the team would like to come and perform at the prison. The group did so with some trepidation, but the rest as they say is history, and very much a part of God’s plan. Over the years Oddments has performed in churches, schools and prisons across the England. Oddments have also been involved in work on a national level. This included working with organizations such as ‘Youth with a Mission’, ‘Operation Mobilization’ and ‘Youth for Christ’ and performances at the popular New Wine Festival and at the National Christian Police Conference. Oddments has been working in prisons for over a decade now. We take the Christian message to men and women who may not have heard about God’s grace in a long time, or ever. 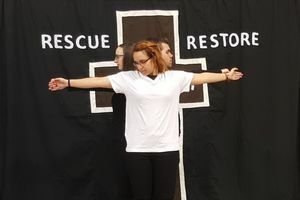 Our main sketch show that we do focuses on how Jesus rescues, restores, and resurrects. We have worked in over 25 prisons across the UK throughout the past several years. We do not charge the prisons for us to come and perform; we are able to go to prisons through donations made to the company. Oddments also works in primary schools. We perform retellings of Bible stories, with high energy, colourful sets, and props. All the stories have lessons to help build the children’s confidence and to teach them how their actions could affect others. Our shows are interactive, and we also do a workshop that shares the theme of the show. We’ve done all sorts of Bible stories, including Daniel in the lion’s den, the Wise and Foolish Builders, the story of Moses, the journey of Jonah, and a lot more! Right now, we are performing David and Goliath, and we’re starting a new production called Ark Adventure, which is the story of Noah and the ark. The theatre company has also performed at churches all over England, and we have many different sketch shows that we perform. All of our shows are roughly 30 to 40 minutes long, and fit into church services nicely. All of the material is lively and engaging to both children and adults alike. Oddments is a product theatre company with a Christian message. 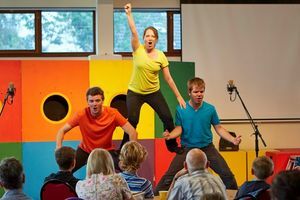 Churches can use us as an outreach tool, we support prison chaplains with a message within drama, and we perform educational Bible-based dramas and productions at schools. Oddments works mainly in England and Wales, and we are hoping to expand our contacts to even more churches, prisons, and schools further to northern England throughout the coming years.